Henley Druid 21kW Central Heating Boiler Stove 12 Radiators. Henley Druid 21kW Woodburning and Multifuel Central Heating Boiler Stove 12 Radiators. This stove will subtly blend into any room interior and provide comfort of heat to the room and also heat your hot water. It provides efficiencies of up to 76% and is fitted with the latest cleanburn technology. Steel Body with Cast Iron Door. Boiler Model (Heats up to 12 radiators). 8.1kw Output to Room. Stovebay is your first stop for Wood Burning and Multi Fuel Stoves, Fireplaces, Flue Pipe, Fireside Accessories, Fireplace & Stove Spare Parts and Homewares. We supply the Best Quality Brands at the Best Price!! We are agents for all of the leading brands and manufacturers including Aarrow Fires & Stoves, ACR Stoves, Broseley Fires, Chesney Fireplaces & Stoves, Contura, DikGeurts, Dru Fires & Stoves, Flame Fireplaces, Henley Stoves & Fireplaces, Hota Luxury Stone Fireplaces, Hotspot, Marble Flame Fireplaces, Mendip, Jetmaster Fires & Stoves, Sperrin Stoves, Stratford Boiler Stoves, Stovax&Gazco Fires, Spartherm Luxury Fires, Stanley Stoves, Valiant Accessories, Villager Stoves and Victas Heat Products. We are a dedicated on-line retailer with a bricks and mortar showroom trading for almost 30 years. We look forward to your custom. Stovebay; Your Local, Online Specialists..
All deliveries take place on week days between Monday and Friday. During busy periods such as Christmas and the colder months, deliveries could potentially be longer. Longer deliveries may also occur with certain items but the individual listings will explain this. 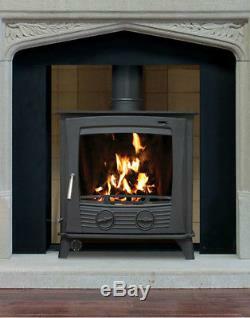 We use a company within the Pall-ex system for all of our stove deliveries. All of these deliveries are'curb side' meaning the driver is not permitted to carry the stove onto your property. However, the driver will be equipped with a lorry that has a tail lift and a pump truck to place the item(s) safely onto the curb side for you. When you receive your stove please fully examine it before signing for it as clean. This includes for example, flexible flue liner and stove rope which has been cut to size and would not be able to be resold. Faulty, Damaged Or Incorrect Items. In the very rare instances that you receive a faulty, damaged or incorrect item from us we will need to be contacted within 14 days of receipt of the goods. We will then require a photograph of the damage, fault or the incorrect item so that we can then action a replacement for you. If the item is damaged, depending on its value we may invite you to dispose of the item in whatever way is convenient to you. If you have received the incorrect item or a faulty item we will arrange collection of the item with our courier company. Cabra Ivory Cream Marble 60 (1524mm) Fi.. Marseilles Ivory Pearl Marble 58 1473m.. Bridge Marfil Stone 58 (1473mm) Firepla.. Drumkeeragh Solid Oak 54 Wood Fireplace.. Cruz Ivory Pearl Marble Complete Firepla..
Jetmaster 16i Woodburning Multi Fuel Cas.. Cabra Sienna Stone 60 (1524mm) Fireplac.. Hemmingway Ivory Pearl Marble 60 1524m.. Henley Druid 8kW Defra Approved Multifue..
Queen Star All Night Burner Solid Fuel O.. Stove Warrior Stove Guard Unique Design..
Stovebay Victorian / WW Fire Grate 16... Get in touch with us. The item "Henley Druid 21kW Woodburning & Multifuel Central Heating Boiler 12 Radiators" is in sale since Thursday, August 16, 2018. This item is in the category "Home, Furniture & DIY\Fireplaces & Accessories\Heating Stoves". The seller is "stove-bay" and is located in Enniskillen. This item can be shipped to United Kingdom.